I own an ED 120 binocular telescope. And want to uprate to a Newtonian binocular. Planned 14" but 10" is more realalistic. Edited by salico, 11 March 2018 - 04:28 PM. "Just more brightness and size" is what gives the breakthrough experience. The combination of increased exit pupil size at equivalent magnification and increased image scale at equivalent exit pupils reveals increased detail in extended objects. My preference is galaxy observing and internal detail is greatly increased when I use larger apertures. It is not subtle. Objects not previously visible are revealed. I have used a few of them. When spot on, they are amazing. Things do appear almost twice as bright when the images from both eyes are combined. They seem best with DSO. The drawback is collimation issues, and sometimes unequal magnification if used with cheap eyepieces. A pair of panoptics works amazingly well though. The eyepieces have to be perfectly matched, as does the over all FL of the system. the memory of the great views through the 14" bino dobs brough by a swedish gentleman to ITV are still etched into my brain... hard to forget. The only disadvantage was the fact that he spent 2h plus with collimation before sundown... but it had been broken down completely for transport. I would only consider sth like this if I had a permanent place for it under good skies or there was some possibility to transport the OTA in one piece and it was rigid enough to keep collimation in the process. you said tubes - I can imagine that one could build sth to hold two solid tubes together in a way so that they can be taken apart and reassembled in exactly the same position. That would help a lot and the solid tubes shouldkeep their collimation. The binodobs of the swedish guy was a truss affair and this was hell on wheels to collimate. I saw solid tubes in the JMI... the point is, transport might be tricky without disassembling the binoscope... Arie Otte (Netherlands, trusstube binoscopes) proclaims 30 mins for re-collimation after assembling the whole thing. Tom, how is your experience with the JMI 16 incher? Edited by salico, 13 March 2018 - 06:20 AM. Unfortunately there is no serious Binocular Reflector producer here in the wider environment. I am not a bino viewer at all, and my particular vision doesn't do binoculars, thru a telescope or even at the football field. But I do have personal experience comparing an Orion 120mm ED scope and a GSO 8" newtonian on Saturn one night, probably some 11 years ago now. Hands down, the GSO (an old Meade LightBridge 8, back when they made them) beat the Orion 120mm ED scope on Saturn. The image was brighter and more detailed. I am certain a 10" would have done even better, so if you think you're a refractor guy now, a 10" newt, should you figure out how to configure it, will convert you, for sure. The collimation and mechanics are the tricky things with these Chinese sourced newtonians, but I'm convinced the optics are actually pretty good. Not saying custom, American/European/Japanese mirrors aren't better, but the standard Chinese mirror these days is really pretty good. Now the mechanicals associated with the scope are often not as good as the optics, so achieving the best views can be difficult to obtain, even tho the optics may, indeed, be quite good. My friend (who owned the 120mm ED) and myself were impressed with the mirror in the Meade LB8. I have a friend with an Orion Intelliscope 10" and the views through it, at least on-axis cause he doesn't own a coma corrector, are spectacular -- Thor's Helmet, Sculptor Galaxy, Jupiter, etc. Edited by CollinofAlabama, 13 April 2018 - 07:49 PM. I had a 120 mm Orion Eon for two years. This is a 120mm F/7.5 FPL-53 doublet and probably better optically than your 120mm Binocular Telescope. I recently sold it because my generic 10 inch GSO Dob was the better all around performer and not just by a little. The Dob was better on the planets, it splits doubles not even worth looking at in the refractor. Globulars, nebulae, galaxies, for deep sky it's a break through experience. As far as binocular Newtonian: In your situation, I would look very closely at a larger telescope with binoviewers. The advantage of a binocular telescope over binoviewers and a larger aperture telescope is that brighter exit pupils, lower magnifications are possible. Both are limited in brightness by the diameter of your dark adapted eye but the binoviewer will be 1/2 as bright. But this advantage exists only at the larger exit pupils. At smaller exit pupils in the binocular telescope, the larger aperture with a binoviewer can make up for this loss of brightness with a larger exit pupil. 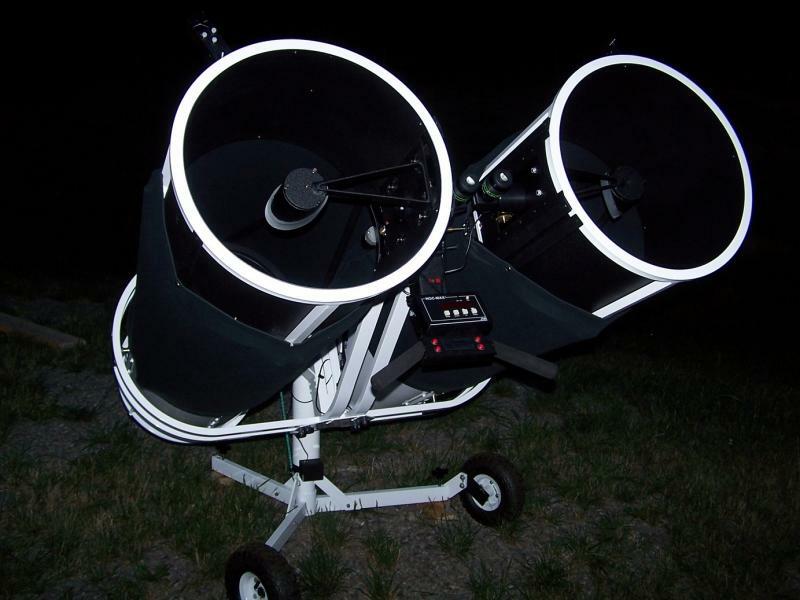 Consider a 10 inch binocular telescope and a 14 inch with a Binoviewer for someone whose dark adapted eye opens to 7mm. . If the 10 inch (250mm) binocular telescope is being used at a 5mm exit pupil, that would be 50x. the 14 inch (350mm) could be used with a 7mm exit pupil which would normally be twice as bright as the 5mm exit pupil (area) but since it is a binoviewer, it would be equal in brightness. This holds true for smaller exit pupils. Exit pupils between 5mm and 7mm are useful but the vast majority of deep sky observing is done with smaller exit pupils. All planetary and double star viewing is done at smaller exit pupils. At smaller exit pupils, the binoviewer has several advantages. It is much simpler both mechanically and optically, it doesn't all the complexity of the collimating and aligning binocular telescope. In theory at least, it has the greater resolving power of the larger aperture. And it can be used alone as regular telescope. At the highest powers, looking for the smallest, most difficult objects, the "cyclops" mode with the larger telescope will go deeper. I think the reason one reason larger binocular telescopes are so uncommon is that a binoviewer is an effective and less costly alternative. I love using wide field eyepieces at low powers but the really good ones like the 41mm Panoptic, the 31mm Nagler, the 21mm Ethos and other similar eyepieces cannot be used binocular style so I am happy to settle for monocular viewing.